I like the word “Tourer”, and the word “Active”. I think the new BMW 2 Series is a great little car! I am just not sure why they have made it. Is it to replace the size and shape of the older A Class Mercedes, or is it to just ensure that for every Mercedes Benz on offer, there is a matching BMW? Having worked for a few years with Germans, I know that they take competition and performance very seriously. And this is not only true in the automotive world – but even in companies that produce a washing machine, or Stainless Steel toasters. So, enter the new BMW 2, I was sent an invite by Cedar Isle Auto – a BMW dealer in Fourways to test drive the newest addition to their family. Luckily for me, to assist with comparisons they had a Mercedes Benz B Class and 2 Series Active Tourer right next to each other, although they have cheated a bit. The Mercedes Benz B Class is coming out in a facelift model around March 2015. For now, my review is strictly on the BMW – a super little car – and later on the B Class once I get hold of both for a few days of testing. Below are some images to start – around the overall design, double Sunroof ( optional extra of course) and the overall “feel” of the car. As promised in previous posts – there wont be too much technical jargon – as the young couple I met with their 3 month old baby, may not have enough time to get through my review, never mind have enough time to buy the car. I did a test drive with Mark McMann from Cedar Isle – great guy, who is full of knowledge and friendly, without being a typical car salesperson – dumping stats and figures, while you try to drive the car. The car was a M Sport 220 D version with an automatic gearbox. Very very quiet for a diesel and very very easy to drive with super light steering. If this car was being driven by a mom or even gran, as the taxi that carts the kids and dogs to school daily, this would be a hit! The interior feels like it is premium, with loads more legroom than on most BMW`s in the back. It handles well, and still has a sporty feel – I think moms coming from other less premium brands would enjoy. This feeling or “soul” of the car is still BMW, even though it`s practical – and at R 378 000 to R 500 000 depending on spec level, may compete with families considering the 3 series or even the X1. Having driven the X1 for over a week, I think the 220D above would be a much easier car to drive daily. Especially in Johannesburg, with potholes – kids moaning on the back seat and load shedding ensuring you spend 35 minutes at each robot. My only gripe was the boot space, not being as big as I thought an MPV should be. 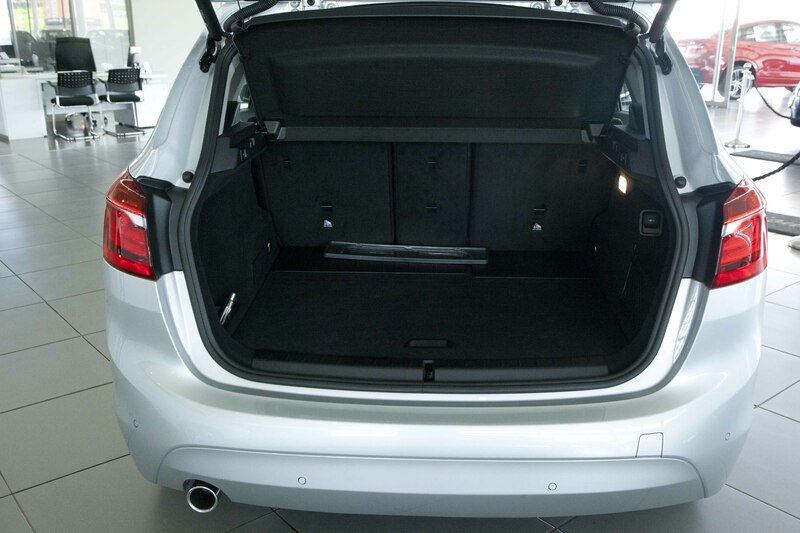 I drive a 320 D F 30 as my personal car and I felt there was just not enough room in the 2`s boot, unless you drop the rear seats. In this one regard, the Mercedes B Class trumps the BMW. Also, a neat folding table attached to the back of the two front seats in the Merc, means Sally and Johnny have a place to store their Mc Donald`s happy meals on their way home from the shops. http://www.euroncap.com/results/bmw/2_series/573.aspx &#8211; Euro NCAP 5 stars – for mums up to 85% rating for child safety on kids! In summary, this is a great car and one of the first that I have tested with Connected Drive! More about BMW Connected Drive in Part 2. Big thanks to Thando and Mark from Cedar Isle – mark.mccann2@bmwdealer.co.za / 011 367 1645 and Alex Boavida from Mercedes Bryanston – 011 460 8600 / alexb@sandown.co.za for Test Drives & more information. This entry was posted in Car Review. Tagged 2 Series Active Tourer, 2 Series Active Tourer Johannesburg Test, 2 Series Active Tourer South Africa Test, Best BMW for Small Family, Best Mommy Car BMW, Best Mommy Car South Africa, BMW, BMW 2 Series vs Mercedes B Class, BMW Cedar Isle Auto, BMW School Run Car, BMW South Africa, Cedar Isle Auto, Fantastic BMW 2 Series Active Tourer, Johannesburg BMW Test, Mark MCCann, Mercedes-Benz Bryanston, Quietest 2.0 Litre Diesel Ever. Thanks for the volume. I was after the dimensions exact. HxLxl? This would be a great info as BMW does not have a clue. Can you believe it ? Thanks for visiting our blog. If you need any more info let us know! did you get any response? I did the same thing and contacted them. The answer they gave me was “we did not measure it”. Can anyone with a meter in the pocket measure it and let us know? and BMW by the same way?